Fiat Chrysler Automobiles (FCA) India is gradually becoming a reputable brand in the Indian automotive industry, and all the credit goes to the emerging service support network across the country. 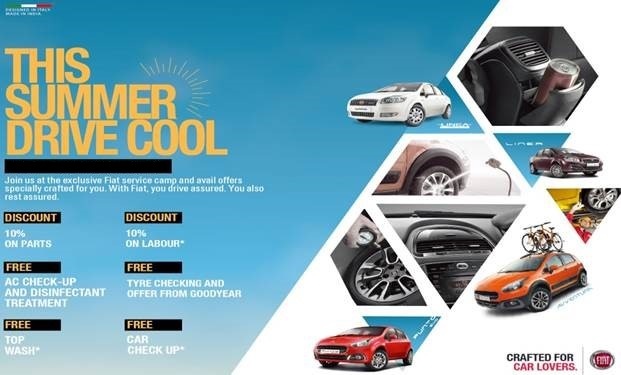 In order to further increase customer interaction, the company is all set to launch a one of its kind campaign in the country called as the ‘Drive Cool Camp’ this summer across all the Fiat dealerships. As the name suggests, this campaign activation will mainly focus on keeping air-conditioning units functioning at their best. Fiat Drive Cool Campaign will aim to reach out to a wide base of customers across the nation. Few of the lucky customers would also get a chance to get some more additional benefits through this campaign. In addition, the company would also be offering special discounts on spare parts, free car check-ups and discounts on other accessories such as Reverse parking sensors etc.